KingSpry congratulates attorney Jonathan M. Huerta, who has been named the Zone 2 Governor for the Pennsylvania Bar Association (PBA) Board of Governors. He will begin his three-year term at the conclusion of the PBA’s Annual Meeting, May 17, in Lancaster. One of 12 zone governors who serve on the PBA Board, Mr. Huerta will represent Berks, Carbon, Lehigh, Northampton and Schuylkill County lawyers. Mr. Huerta has been a member of the PBA House of Delegates since 2014. He is a member of the PBA GLBT Rights Committee, PBA Membership Engagement Blue Ribbon Panel and PBA Minority Bar Committee. He is a past member of the PBA Education Law Section. 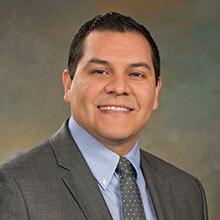 At the local level, Mr. Huerta is a past chair of the Northampton County Bar Association Young Lawyers Division. He is the chair of the Greater Lehigh Valley Chamber of Commerce’s LGBTQ Business Council, and a board member of the Cancer Support Center of the Lehigh Valley. In addition, he is active in the Philadelphia Texas Exes Alumni Association and the Penn State Alumni Association. Mr. Huerta is a graduate of the University of Texas at Austin and earned his Juris Doctorate at the Pennsylvania State University Dickinson School of Law.